The palate is the roof of the mouth in humans and other mammals. It separates the oral cavity (mouth) from the nasal cavity. A similar structure is found in crocodilia, but, in most other tetrapods, the oral and nasal cavities are not truly separate. The palate is divided into two parts, the anterior bony hard palate, and the posterior fleshy soft palate or velum. The hard palate is formed before birth. If the fusion is not complete, it is called a cleft palate. This is a birth or congenital defect. 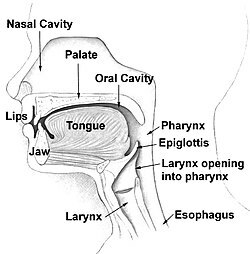 As the roof of the mouth was once considered the seat of the sense of taste, palate can also refer to this sense itself, as in the phrase "a discriminating palate". By further extension, the flavour of a food (particularly beer or wine) may be called its palate. This page was last changed on 4 July 2018, at 12:14.